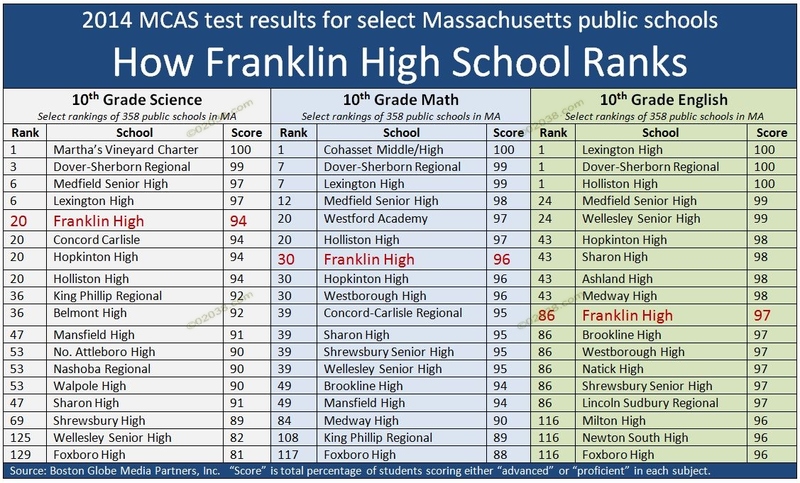 Of the 358 public secondary schools in Massachusetts for which 2014 MCAS test results were reported, Franklin High ranks 20th in the Commonwealth on the MCAS Science test. 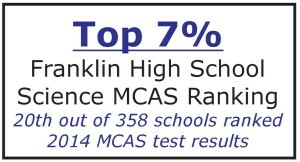 That puts Franklin in the top 7% of all public secondary schools in the state for science! Franklin High ranks the same in science as such top drawer local schools as Hopkinton and Holliston High. 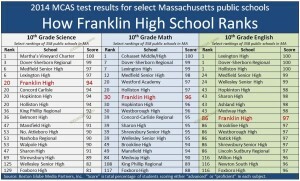 Franklin scored higher in science than Sharon High, Wellesley High, King Phillip Regional, and Foxboro High. 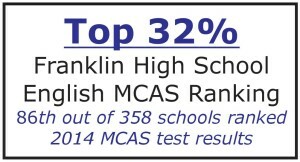 Franklin’s 96 score in the 2014 MCAS Math test was high enough to rank the school 30th out of the 358 public secondary schools for which 2014 MCAS Math test results were published. Franklin High School ranks in the top 10% of MA public schools in math! Franklin tied or scored higher in math than a slew of top suburban high schools including Sharon, Hopkinton, Westborough, Concord-Carlisle, Wellesley, Foxboro, and Medway. That is wonderful news for Franklin High! 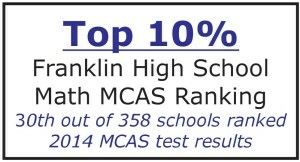 Franklin High scored an excellent 97 out of 100 on the 2014 MCAS English test. Franklin scored higher in English than in either math or science. Yet due to the Globe’s “skip” ranking system, Franklin placed at 86th in the Commonwealth, despite the very high 97 score. (Hence the criticism of the Globe’s ranking system.) A 97 out of 100 MCAS English test score puts Franklin High in the top third of all Massachusetts public secondary schools in English. Simply put, the 2014 MCAS test results mean that Franklin High School is doing a superlative job getting students ready for careers involving math and science. And the fact that 97% of Franklin High’s 10th graders tested at either advanced or proficient in English says nothing but good things about the English department as well. Franklin taxpayers are getting their money’s worth at Franklin High! One more thing to keep in mind about the 2014 MCAS test results for Franklin High: the wonderful scores were achieved in the OLD facility that had a sorely deficient physical plant. The new Franklin High School opened recently and it’s beautiful and loaded with technology! If you’re looking to buy a home in the I-495 region, give Franklin, MA serious consideration! Franklin offers great schools, affordable housing and a wonderful lifestyle!